ENERGY: After four years with ME, Bente Anita Pilskog has finally got the energy and happiness back. After receiving prayer from Svein-Magne in Ulsteinvik she was rid of the disease. Now she can go hiking in the mountains without getting exhausted. Throughout four years Bente Anita Pilskog from Ulsteinvik struggled with the Chronic Fatigue Syndrome ME. Each day was an ordeal, and a lot of her everyday life went into bedresting. 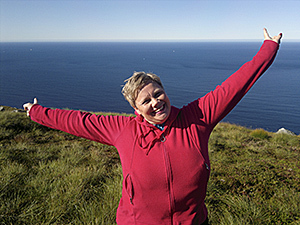 After receiving prayer from Svein-Magne Pedersen in Ulsteinvik she has both energy and her life back. In 2009 Bente Anita Pilskog from the town of Ulsteinvik started getting very sick. She had pain in her lungs and coughed for two months. The doctors could not figure it out, and no errors were detected in different examinations she had performed. After some time she was so ill that she did not know what was up and down in 24 hours. The doctor gave her only a partial sick leave, but when the coughing finally let go, she was completely worn out. -The sad part of it was that she did not get her energy back. The heavy feeling of exhaustion did not disappear. Eventually it became clear that I had ME, she says seriously. ME is a chronic fatigue syndrome and there is considerable disagreement amongst doctors and experts in terms of its cause and treatment. Around 20,000 Norwegians have the disease, and many are very sick. -My doctor said that there is nothing called ME. He did not want to give me a full sick leave and thought that I should work out to get better. I tried the best that I could, but it does not help to work out one day, when you are worn right out of exhaustion in the following days. For an entire year I struggled with lack of sleep. I could not sleep one hour without sleeping pills. Eventually Anita changed doctors. The new doctor showed a far greater understanding of her situation. -ME is a disease that is difficult to explain to someone who has not experienced it. A person looks completely healthy, but in reality one is in terrible shape. You walk around with your body being worn out all the time, even when you are resting. When I woke up in the morning, I should have basically been rested, but it felt like I had just been on a three-hour hike. The disease destroys your life completely, she says. Her job as a teacher was not easy either, and every time she came home, she was exhausted. -The principal of the school pointed out that I had lost my glow and energy, because I have been a bubbly person. Along with the sickness, a number of other ailments followed. Bente Anita got stomach problems and became allergic to different foods. In addition, she got brain fog, which was very uncomfortable. -It felt like I had a type of fog in my head, and I was heavy and unfocused in the head. Life was very strugglesome. Bente Anita went through several periods of sickleaves of varying degrees. A great deal of the day went into resting in the bedroom. -I could not continue life this way. I therefore pushed myself into working, because I wanted to meet some people. For Bente Anita it was still a great challenge to be in large crowds. Even family dinners were a struggle. Her body reacted to both noise, light and smells. -I had regularily attended the church in Ulsteinvik, but I had to stay home in recent years.There were too many people and loud noises. Despite the body's reaction to large crowds, she chose to make the trip to Oslo to watch a soccer game. In November 2012 her local soccer team Hødd played in the soccer Cup final against Tromsø, in Oslo. Bente Anita had gotten tickets, but knew that this would be a great challenge. Nevertheless, she went to Oslo. -I went purely out of spite against the disease. I was not going to miss this game. At Ullevål stadium there were 24,000 spectators. I had to use earplugs, but the game was fun. The rest of the weekend I still had to spend on the couch resting. It was of course a strenuous trip. In the winter of 2012, she got slightly better, but the general exhaustion did not go away. After a few months, all the other symptoms returned. The condition was now only worse. There was no medication that could help, and there was nothing that the doctor could do. Bente Anita has worked as a missionary in Thailand and is therefore well aquainted with the faith in Jesus. She belonged to Ulsteinvik church, but as earlier mentioned, had not been there in a few years. When Anita heard that Svein-Magne Pedersen was coming to town, she decided to go. She knew of Pedersen's work, but had never been to a meeting with him. Bente Anita knew regardless what a challenge it would be to go to such a meeting with lots of people and loud sounds. Saturday, September 14, 2013, she went to the cultural center of the city where Ulsteinvik Bible Center arranged meetings with Pedersen. -I was so unfortunate and ended up in the very back of the queue. The meeting was therefore a great challenge, and the intercession lasted into the night. I was so tired that I was almost lying on the floor. Finally a friend of mine went and asked if I could get ahead in the queue, otherwise I might have to go home. Pedersen asked her to come forward, and when he prayed, she felt a warmth from his hands. Eventually it began to fizz and bubble in her chest. She then went home, but did not think anymore of the prayer. -The next day I woke up very rejuvenated. It was not until my husband pointed out that I seemed so rejuvenated, that I realized that something might have happened. Normally I would have been wiped out after such an overstrain as the Saturday meeting. Suddenly I did not feel tired, and the heavy feeling of exhaustion was not there. Day after day passed without it returning. It was incredible. I was healthy for the first time in four years! About three months after the meeting in Ulsteinvik Bente Anita was still in good shape. Now she is in normal activity without getting tired. -I'm back at work as a teacher one hundred percent and I have called off the application for temporary disability. Now I exercise without getting tired. When I went to see the doctor, I told what had happened. She thought it was good and made no counter-arguments. Instead, she asked to have the name of Pedersen. She had in fact other patients with ME who might be able to get the same help. It is amazing what has happened. God is good. It's like getting your life back!